The Statue of Liberty in New York. Opening hours: Daily except Dec 25 from approx 8.30 am - last ferry back 5.45 pm. One of the worlds most well-known statue. Formal "Liberty Enlightening the World", it stands at Liberty Island in New York harbour. Buy the ticket the day before! Sometimes there could be very long queues to the box office. Buy the ticket the day before and you can stand in line to the ferry directly in the morning after. The Statue of Liberty was inaugurated October 28, 1886 and was a gift to the American people from the French people as a symbol for both peoples friendsship to each other during the american revolution. The statue is 46 metre and is placed on a 47 metre high base of cutted stone. From the ground to the torch it will be more than 93 metres. The Statue represent a women, with a shining crown, in a dress and with chains from the slavery under her feets. In her right hand she is holding a torch against the sky and in the left hand a board with the inscription "July" (July 4, 1776, the date of the adoption of the Declaration of Independence - the colonies in America declared their freedom from Great Britain). If the crown is opened you can walk the 168 steps up to the top. 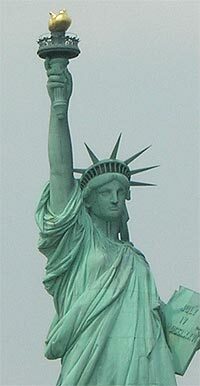 The Statue of Liberty have welcomed immigrants and visitors in over one century and are in the world a symbol of freedom and hope. At the base you will find the text "Give me your tired, your poor, Your huddled masses yearning to breathe free, The wretched refuse of your teeming shore. Send these, the homeless, tempest-tossed to me, I lift my lamp beside the golden door!" You come here from Battery Park/Castle Clinton or Liberty Park in New Jersey. The ticket to the ferry includes both Ellis Island and the Statue of Liberty in the same trip. 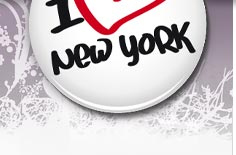 (Of course you don´t have to visit both places if you don´t want to). The trip with the ferry costs 17$ for adults (2013) and includes a visit at the Statue of Liberty (not the crown) and Ellis Island. (If you don´t have so much time to spend, buy the ticket the day before the trip, due to that it can be very long queues in the mornings at the ticket sale or buy your ticket online before you leave ). 3 experiences in one super price!! The Statue of Liberty + Empire State Building Observation deck (86th floor) + 3 days Hop-on /Hop-off bus on Manhattan. The ferry ticket also include a stop at Ellis Island if you like to hop off there. The French ship "Isere" transported the statue in about 300 copper parts packed in 214 boxes. The ship was very close to sink in the rough weather, but she arrived in New York on June 17, 1885. She was in parts until the pedestal was completed in 1886. 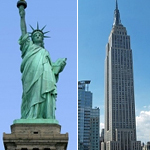 The Statue of Liberty was New York's highest building until 1899 when the skyscraper Saint Paul's Building was higher. President Calvin Coolidge declared the statue to become a national monument on October 15, 1924. 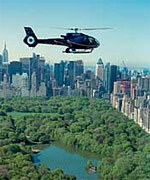 Get an experience of a life time and a fantastic view of the Statue of Liberty with Liberty Helicopter - The Big Apple Tour. 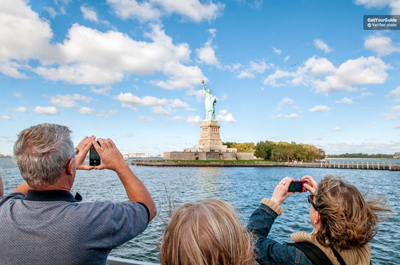 You will see Americas most famous landmark - Statue of Liberty! The flight will take you to the Empire State Building, Chrysler Building, Woolworth and Met Life (Pan Am) Buildings, Ellis Island and New York Harbor, George Washington Bridge and Central Park.